Harry Best is a steeldrum player, vocalist and composer who has been performing in the San Francisco Bay Area for over 15 years. This former leader and co-found of the Harmonics Steelband has also appeared with Tropical Vibrations Band, Pan Extasy, Steel Ivory, I-World, Our Boys Steelband and other ensembles. 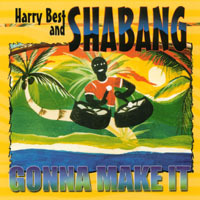 Formed in 1995, Shabang performs a wide vareity of exciting dance and concert music highlighted with the sound of Caribbean steeldrums. Affectionately known as "pans", steeldrums are hand-crafted and finely turned from 55 - gallon oil barrels. The music ranges from infectious Afro-Caribbean rhythms of reggae, calypso, soca, bossa, samba and salsa to engrossing arrangements of jazz and popular standards. With dancing audiences, the energy and enthusiasm generated by Shabang is tremendous. The only cure for this insatiable musical frenzy is more. For over 18 years, the Harmonics Steelband has warmed the hearts of Bay Area music lovers and party-goers with the scintillating sounds of its steel pans and its pulsating Caribbean rhythms. At parties, weddings, receptions, promotions, concerts and festivals, these exciting musicians create an ambiance that leaves a lasting impression. Through years of experience, the Harmonics have developed a dynamism in touch and tone together with a musical repertoire to suit just about any occasion. While their main course of music is the happy polyrhythms of calypso and reggae, the group also includes in its repertoire some bossa, classical and contemporary tunes. The group's instrumentation delivers a full range of musical sound - from soprano pans to bass pans, with double tenors, second pans, guitar pans and cello pans providing midrange accompaniment. Rhythm support is provided by players on congas and trap drums. Whether the occasion calls for dancing, listening or background music, the Harmonics have demonstrated they know how to make the event truly special. They bring the same enthusiasm to a cocktail party that they project on the stage of a festival or a chamber concert. The band truly exemplifies the Spirit of the Caribbean. GROUNDATION is an original 10-piece Roots Reggae band featuring a full horn and backing vocal section. Saying that Groundation is a Reggae band is merely scratching the surface. While capturing the essence of true Roots Reggae, Groundation aims to take the genre to a new height by blending elements of both jazz and reggae in their sound. They have shared the stage with such legendary acts as Israel Vibration, Gregory Isaacs, Pato Banton, the Congos, Apple Gabriel, Morgan Heritage, and Marcia Higgs. Individual members of Groundation have played with Third World, Spearhead, Ras Michael, Eek -A- Mouse, Marcia Higgs, Wise Monkey Orchestra, Cannonball, and Cosmologic, just to name a few, as well receiving numerous Jazz degrees from distinguished Universities. Lead singer and songwriter Harrison Stafford has taught the only University course on the History of Reggae Music offered in the United States. Groundation also performs the reggae classics of Bob Marley, Peter Tosh, Israel Vibration, Joe Higgs, Black Uhuru and more. By combining roots classics with originals their shows become a lively celebration where audience and band are one. Pan Extasy is a unique and dynamic Caribbean band which brings out the best melodic sounds. Pan Extasy has played around the world, sharing the unique and distinctive sounds of the Caribbean. Add the festive sounds of the Caribbean to your next occasion. Experience the magic and upbeat energy of the Caribbean. When the sounds of socca, reggae, calypso and Caribbean jazz collide, it can only be described as pure extasy, and this is what Pan Extasy is truly about. They are said to be one of North America's most powerful and promising reggae acts in years. The diversity in their range of fans demonstrates their ability to move the most hard-core reggae enthusiasts as well as a wider, more universal audience, and keep them dancing from start to finish. Influenced by old school studio one style, conscious roots, dub, and cultural dance hall, the band takes what they have learned from their reggae heroes and funnels it into a unique sound all their own.